oon after Windows 8 official release at the end of October HTC introduced their first Windows 8 smartphone. It’s called HTC 8X. The design is completely different from what we are used to seeing in this brand’s models. It quite a lot resembles Nokia Lumia appearance, the other thing they have in common is the Phone 8 platform. The looks here are unique and specifically distinctive with the rubberized back surface which feels great and also provides comfortable grip. The cool thing is that it provides a variety of fresh colors framing the screen. These are graphite black, California blue, Limelight yellow and flame red. The front features a big 4.3 inch bright Super LCD2 capacitive touch screen with 16M colors protected by 2nd generation Gorilla Glass technology. The screen brings excellent colors, great contrast and sharpness in HD resolution. The bright display and the pixel density of 342 points per inch is the thing we liked the most about HTC 8X. The CPU on board is a dual-core 1.5 GHz Krait and the chipset – Qualcomm Snapdragon. The operating memory on its part is 1GB. The CPU potential is fully revealed by the brand new and ultra flexible Windows Phone 8 platform. Its tile interface which is updated real-time gives you instant access to all the latest news and stories. You can create a live tile for anyone and anything so that you know all about it right from your front screen. The beats audio technology inside brings an enhanced studio quality sound so that you can completely enjoy you favorite tracks right from the phone.Both cameras on HTC 8X feature high-end optics for sharp and crisp images. The main camera is placed centrally on the backside of the handset and has 8MP, it features auto focus, LED flash and a BSI sensor that provides much better low-light captures. It is quite bright as well because it opens up to F2.0 aperture. For better image and video recording there is a dedicated HTC Image Chip inside the 8X. The front optics have 2.1 MPs and are placed on the top left corner. The front camera is also as bright as F2.0 aperture and records video in FullHD quality. It provides an enhanced share experience as its capture range covers an 88 degree wide angle. It is nearly triple the area of what most front cameras capture. It perfectly fits in the frame a group of people including the background. The really cool thing is that the case periphery features a direct camera snap key. The graphic processor is Adreno 225. Unfortunately there is no memory expansion option as there is no micro SD card slot on the HTC 8X. The internal memory is 16 GB. The SIM card type you need to use on this smartphone is micro. On the bottom of the case there is one micro USB v2.0 that also serves as a charging port. The capacity of the Li-Ion Polymer battery is 1800mAh and the case doesn’t provide direct access to the battery unit. The connectivity technologies on board include the more and more common NFC. 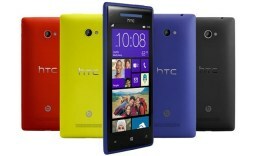 The weight of HTC’s first Windows 8 smartphone is only 130 grams that come in only 10.1mm thickness.